where ko, ki and k2 are the model parameters and f, and f2 are purely geometric functions of the view zenith angle 9, the solar zenith angle 90 and the view-solar relative azimuth <J>. The kernels fi and f2 are derived from simple physical models of the interaction of light with the structured surface. The "geometric" kernel fi represents the effects of shading by protrusions on the surface. 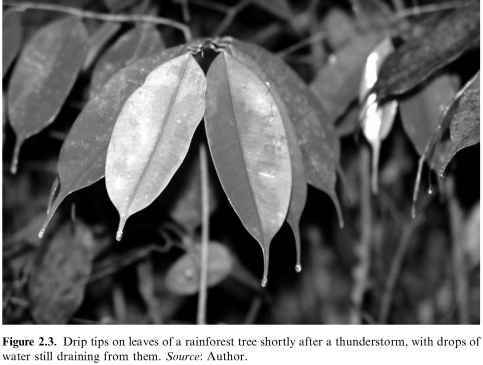 The "volume scattering" kernel f2 captures the effects of multiple scattering by reflecting facets (leaves or soil particles) spread through a thick layer. For the POLDER surface directional signature product, the Roujean model is fitted separately for each 7x7 km pixel and for each of the four spectral bands. Thus for each 30-day windowing period, there are twelve maps at 7-km resolution: the three model parameters at each of 443, 670, 765 and 865 nm. This dataset is being compared with a 32-type classification of Australian land cover in terms of growth form and fractional foliage cover that is based on AUSLIG (1990). Some initial results from this analysis are now presented. Grant (2000) gives more detail. The top panel of Figure 5 is a map over Australia of the k2 parameter at 670 nm for the thirty days centred on 15 June 1997. 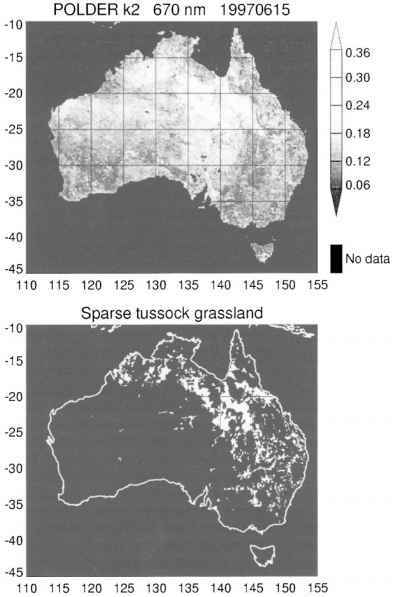 The bottom panel of Figure 5 shows the distribution of sparse grassland with a projective foliage cover of 10-30% (class code G2). The regions of k2 > 0.36 in northern Australia correspond strikingly to a subset of the grassland regions. Similar correspondences also appear for other vegetation types, and in other parameters and in other bands. This indicates that the vegetation type influences the directional signature, as is expected from observations and modelling reported in the literature. If the directional signatures are similar within a region of uniform land cover type, then it might be feasible to fit a single BRDF model or model shape to a region. 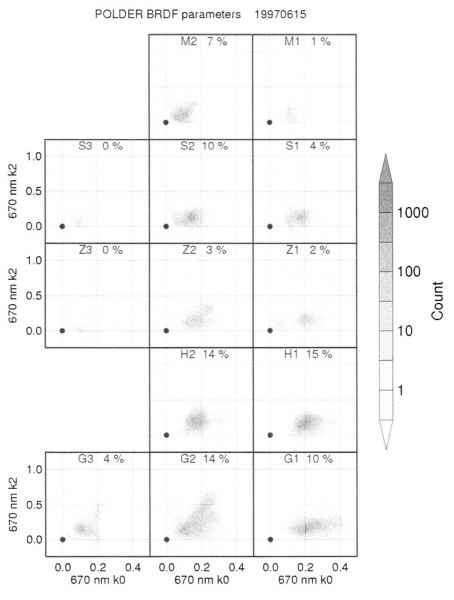 In order to examine how uniquely the model parameters are predicted from the vegetation class, two-dimensional histograms such as those in Figure 6 have been examined. In Figure 6 the two-dimensional histogram of parameters and is plotted for each of several vegetation classes. Some trends in the distributions' central tendency with growth form and density are evident. However, the spread of parameters within classes is at least as large as the differences between classes. 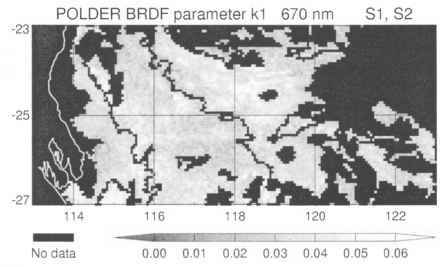 This large spread also appears for k, and other bands, and suggests that factors other than the coarse description of vegetation structure represented in the land cover map used control the directional reflectance. These could include details of the vegetation canopy structure, leaf area index, soil type, rainfall history and topography. Caution is needed in interpreting parameter triplets (ko, k]; k2) as uniquely labelling a particular BRDF. The kernel functions fi and f2 can be similar in shape, particularly for small solar zenith angles. Thus when fitting the Roujean model to a set of data, an error in parameter k, can be compensated by the error in parameter k2. Figure 7 shows a region of the map of the parameter k, at 670 nm for one particular vegetation class, sparse tussock grassland. The area is in tropical Australia in December, so the sun is high (i.e. the solar zenith angle is small) at the time of the ADEOS overpass around 1030 local time. The parameter k] shows strong spatial structure on all scales down to the pixel level (7 km s 0.07°). Maps of ki and for the whole continent show similar fine structure in December, but not in June when the sun is relatively low (not shown). However, when the Roujean model is evaluated with the mapped parameters (k, as in Figure 7, and the corresponding ko and k2) for one particular set of sun and view angles, yielding a directional reflectance, the spatial structure is much smoother (Figure 8) than for the parameter ki in Figure 7. Thus ki and k2 are correlated, and some of the spread in two-dimensional histograms such as those in Figure 6 may give a misleading indication of the spread of directio nal signatures within each class. Grant (2000) discusses this in more detail. Eliminating the spurious spread in the Roujean parameters is the next step to be taken in this survey of Australian directional reflectance signatures.